The main viewport is where the sample is visualised. The mouse can be used to perform zoom and rotation on the sample. Indicates the current stage of the reconstruction process and can be used to go back to certain stages or advance to the next stage. Presents options related to the particular stage of the reconstruction. The next and previous button is used to advance or go back to next/previous stage. The following is a step-by-step guide for completing a bone reconstruction. 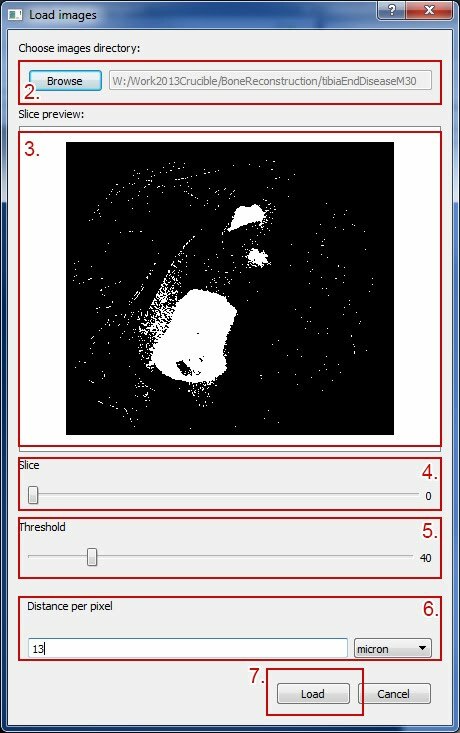 Use the menu “File” then “Load images” in order to begin the process of loading a data set. Click on the “Browse” button and then select the folder in which the images are stored. The loaded images will be displayed below. The Frame slider can used to browse through the image sequence. A “Threshold” can be chosen by using the Threshold slider. This is in order to filter out noise in the image. Use this in conjunction with the Frame slider to make sure the noise level is acceptable in all the frames. The distance unit is then specified. This determines the distance of one pixel in either microns or nanometers. Press “Load” to load the image sequence. The program will then proceed to merge all the image slices and create a volumetric representation of the data set. This stage enables the selection of continuous volumes within the sample data. Unselected volumes are filtered out before the next stage. This helps the software to perform a better reconstruction. 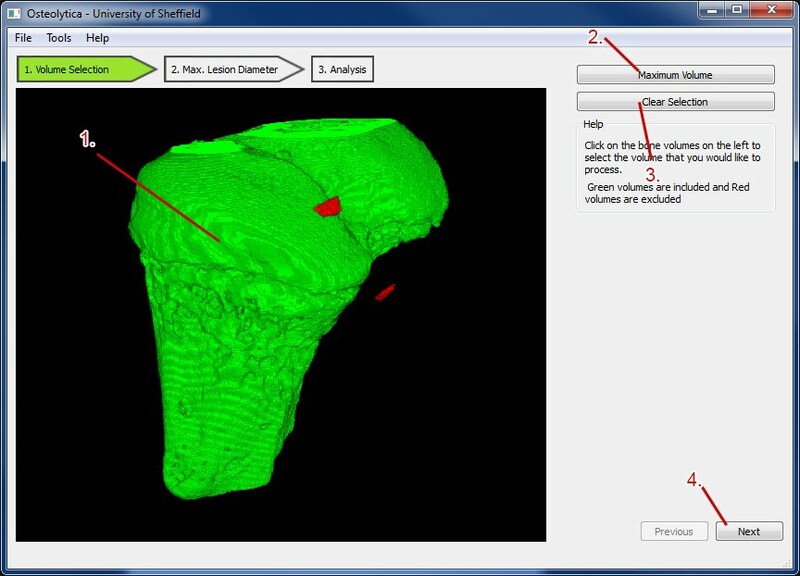 Left click anywhere on the bone volume in order to select it. Click it again to de-select. Alternatively click on the “Maximum Volume” button to select the maximum volume. All selections can be cleared using the “Clear Selection” button. Press “Next” to continue to the next stage. Note: If no volumes are selected (default) then no volumes will be filtered out. 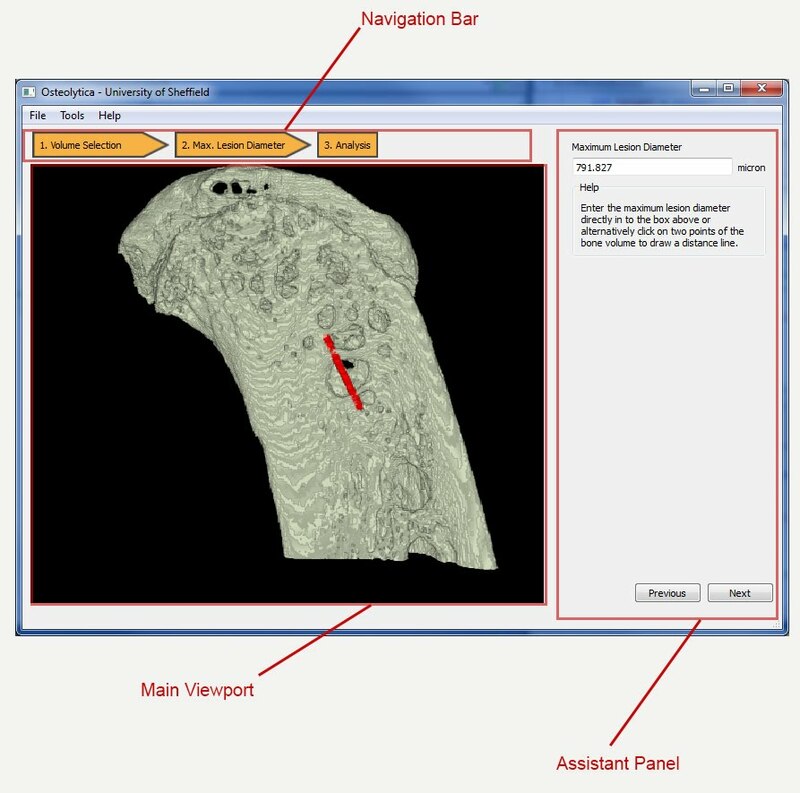 During the reconstruction process, the software uses a dilation of existing bone surface in order to create a reconstruction surface. This amount of dilation is determined by the lesion diameter. 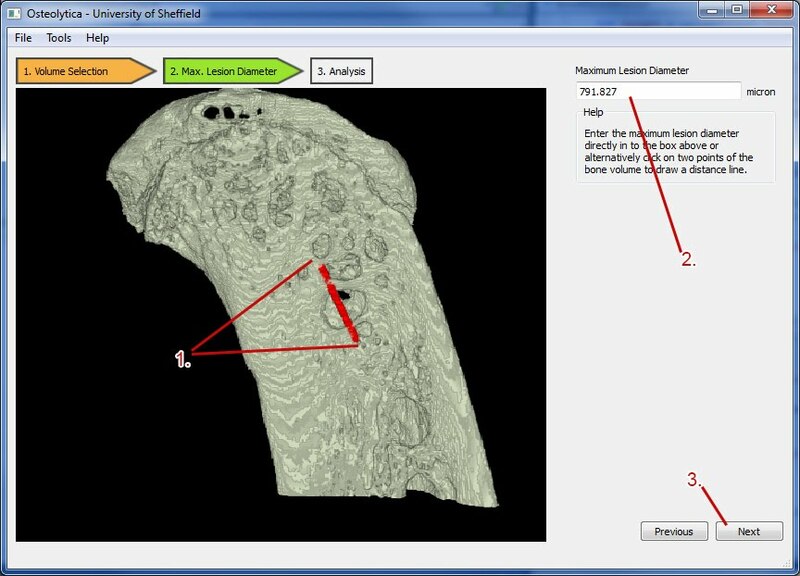 Click on any two points on the bone volume to draw a line representing the maximum lesion diameter. Rotate the view in order to make sure the line is in the position you expect. Alternatively a value can be manually entered. Click “Next” to proceed to the next stage and starts the reconstruction and analysis process. Note: If holes still exist in the next stage, it will be necessary to come back to this stage and repeat the process. This stage shows the result of the reconstructed surface combined with the original bone volume. Reconstruction Parameters” area shows the parameters used in order to obtain this reconstruction. The “Reconstruction Volumes” list shows all un-connected lesions. This can be used to include/excluded lesions from the final tally. 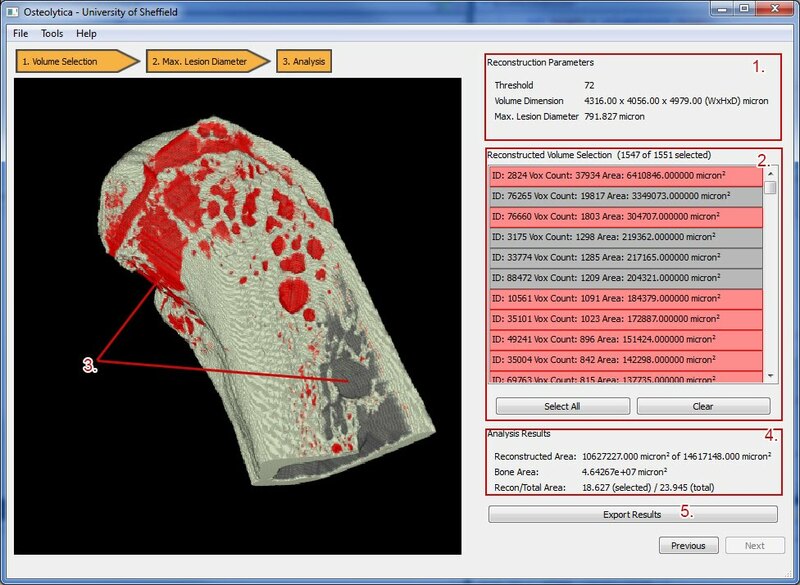 The results will also show on the bone volume (red is included and grey is excluded by default). The reconstructed regions can also be included/excluded by clicking directly on the bone. The “Analysis Results” displays all statistics about the included reconstruction volumes. The “Export Results” button can be used to export obtained results in a comma separated value format. The colours of the bone at every stage can be changed by clicking on the colour box. The density slider is used to set how transparent the visualised bone voxels are. The distance unit scaling can also be viewed on this screen.